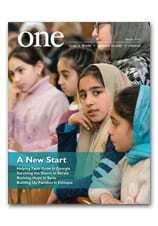 In the Autumn issue of ONE, writer Nicholas Seeley reports on how Catholic health care initiatives are helping refugees in Jordan. Here, he offers more insight into how small faith-based charities are making a difference. One of the interesting things about writing this story, for me, was the opportunity to reflect on the significance of local and faith-based organizations in emergency situations. When a huge humanitarian crisis occurs, the United Nations, governments and large international aid agencies quickly step in, and often they seem to monopolize the response with huge aid requests and high-profile projects, like Jordan’s Zaatari refugee camp. But they are not the only players. It is hard to speak in concrete terms about how much of a role local faith-based organizations play — both because there are so many of them and because their donations are often irregular. Officials at several such agencies have told me they rely extensively on private, mostly Jordanian donors, rather than institutional contributions, and the amount of money they have at any given time can vary. Often a single large donor will pay for a load of blankets to be distributed, or for food to be provided for a few dozen families. Other times, the charity will pool smaller donations for ongoing programs, but those can only run as long as the funds keep coming. Tracking the total impact of these disparate efforts would be a massive undertaking. But even aid workers from the big agencies say that a great deal of the support refugees in Jordan have received — perhaps the majority — has come from such faith-based organizations. Today, both the United Nations and several of the organizations themselves have warned that that support is flagging. The sheer scale of the Syrian influx has strained Jordan’s public services and economy. Local donors are exhausted, and often feel they are in increasingly difficult economic straits themselves, so the support that sustained local charities has waned. In some places, there have even been complaints that impoverished Jordanians can no longer get assistance, because all the aid is going to refugees. United Nations officials have said that the amount of money they have, huge though it is, will not be enough to provide for even the most basic needs of the Syrians if the assistance provided by local groups continues to diminish. Certainly the role of large institutional donors and the international community should not be diminished either. But it is important to remember just how large and how critical a role is played by the accumulated efforts of small, local, faith-based organizations — even in the biggest emergency. To learn how you can help support CNEWA’s work in Jordan, visit this page. You can read more about Syrian refugees in Jordan in Overwhelming Mercy, in the Autumn issue of ONE.